Abcam’s GM-CSF Receptor alpha (CD116) Human in vitro ELISA (Enzyme-Linked Immunosorbent Assay) kit is designed for the quantitative measurement of GM-CSF R alpha in serum, plasma, and cell culture supernatants. A monoclonal antibody specific for GM-CSF R alpha has been coated onto the wells of the microtiter strips provided. Samples, including standards of known GM-CSF R alpha concentrations, control specimens or unknowns are pipetted into these wells. During the first incubation, the standards or samples and a biotinylated monoclonal antibody specific for GM-CSF R alpha are simultaneously incubated. After washing, the enzyme Streptavidin-HRP, that binds the biotinylated antibody is added, incubated and washed. A TMB substrate solution is added which acts on the bound enzyme to induce a colored reaction product. The intensity of this colored product is directly proportional to the concentration of GM-CSF R alpha present in the samples. This kit will recognize both endogenous and recombinant Human GM-CSF R alpha. 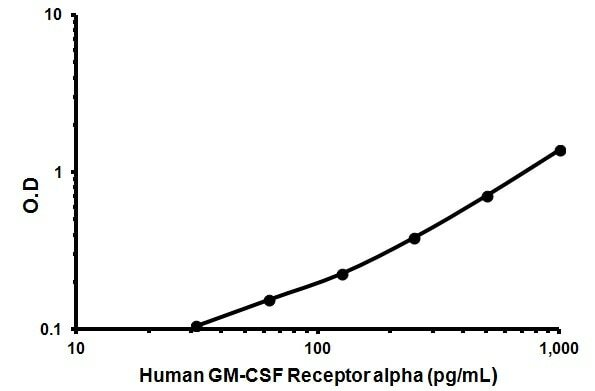 GM-CSF Receptor alpha is the alpha subunit of the heterodimeric receptor for colony stimulating factor 2, a cytokine which controls the production, differentiation, and function of granulocytes and macrophages. The encoded protein is a member of the cytokine family of receptors. This gene is found in the pseudoautosomal region of the X and Y chromosomes. Multiple transcript variants encoding different isoforms have been found for this gene, with some of the isoforms being membrane-bound and others being soluble. Our Abpromise guarantee covers the use of ab46086 in the following tested applications. ab46086 has not yet been referenced specifically in any publications. Publishing research using ab46086? Please let us know so that we can cite the reference in this datasheet. I would like to know whether GM-CSF is capable of interfering with the GM-CSFR alpha chain ELISA. Thank you for your enquiry. The information available concerning this kit suggests that it will still recognize the GM-CSF Receptor when bound to the related cytokine (GM-CSF). This has not been verified by our lab. I hope this information is helpful to you. Please do not hesitate to contact us if you need any more advice or information.